All our cards are hand made and printed on 300 gsm recycled Kraft card. 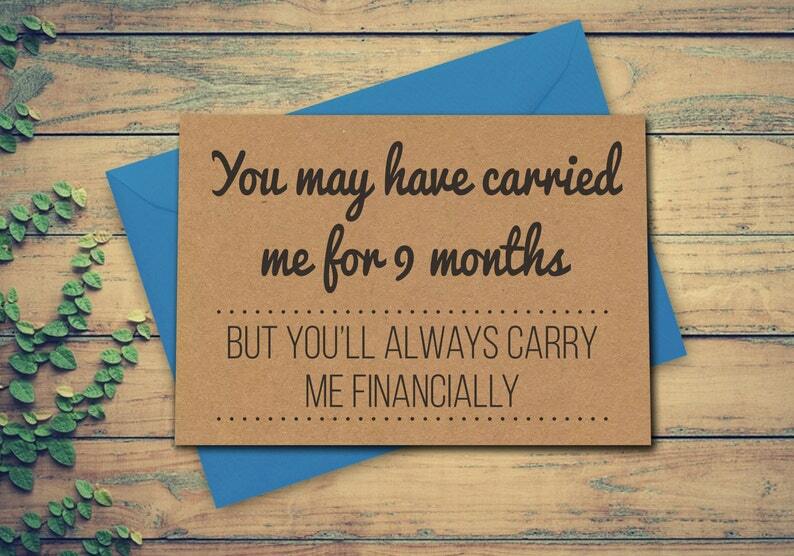 This card reads "You may have carried me for 9 months, but you'll always carry me financially". The card measures 148 X 105mm and is blank inside for you to write your own personal message. The card comes complete with coloured envelope and card and envelope come cello wrapped for their protection. We ship all orders the same, or next working day. All are cards are individually cello wrapped, complete with envelope. We post all UK orders by Royal Mail First Class. Please allow 5-10 days for first class mail to arrive before making an enquiry. International orders are sent by Royal Mail International Standard delivery, and should arrive in 5 - 7 days. Please allow up to 14 days for international mail to arrive before making an enquiry.